Stevia comes in many forms. Make your choice based on the amount of sweetness you want (white extract powders are the sweetest) and how well a particular recipe or beverage will be complemented by the licorice-like flavor of less-refined forms. Tip; You can’t replace sugar or honey on a cup-for-cup basis with stevia — the herb is much sweeter. For more of the flavor and sweet constituents of the stevia leaf to be released, drying and crushing is necessary. A dried leaf is considerably sweeter than a fresh one, and is the form of stevia used in brewing herbal tea. Dried stevia leaf may come in bulk or packaged like tea bags. You can also get it finely powdered. It has a greenish color and can be used in a wide variety of foods and beverages, including coffee, applesauce and hot cereals. You also can use it to make an herbal tea blend. Its distinctive flavor is reminiscent of licorice, which will blend very well with different aromatic spices, such as cinnamon and ginger. The form in which stevia is primarily used as a sweetener in Japan is that of a white powdered extract. In this form it is approximately 200 to 300 times sweeter than sugar (by weight). This white powder is an extract of the sweet glycosides (natural sweetening agents) in the stevia leaf. Not all stevia extract powders are the same. The taste, sweetness and cost of the various white stevia powders will likely depend on their degree of refinement and the quality of the stevia plant used. You may find that some powders have more of an aftertaste. Since extracted stevia powder is so intensely sweet, we recommend that it be used by the pinch (or drop if diluted in water). Once mixed, this solution should be stored in the refrigerator. These come in several forms. There’s a syrupy black liquid (that results from boiling the leaves in water), which can enhance the flavor of many foods. Another type is made by steeping stevia leaves in distilled water or a mix of water and grain alcohol. You can also find a liquid made from the white powder concentrate mixed with water, and preserved with grapefruit seed extract. I would like to buy Stevia seeds and plant them. I’ve read that the plant is way heathier than any of the extracts or powders. Is this true? Also, are there any harsh side effects in using Natural Stevia Leaves? I have used Stevie in white powder form for over 25 years. The company, Kal (red and white jar) is in my opinion the best brand to use. Over time it can loose it’s strength so it is best to buy the smaller size. Vitamin Shop carries this brand. Try to stick with small amounts although it is good on everything be careful to limit the amount each day. My side effects were to some degree a circulatory problem.Just use the tiny spoon inside the jar. You may not need even this much.Its great just for coffee or tea alone and I feel safe using it now that I’m limited to sugar. I am a cancer survivor. Nice and informative site.. I just purchased a plant..
Is Stevia in the Raw the same as plain Stevia. Im not supposed to have items that have hidden sugars nor am I to have the artificial sweetners. I can only find Stevia in the Raw, but notice it has Dextose. Isnt that a sugar? I am confused as to when I should use stevia powder when I should use stevia liquid? Also wanting to make a sugar free fudge using stevia not sure what to use any ideas? Also wanting to make sugar free macaroons what kind form of stevia should I use? In my experience, stevia powder is better used in warm liquids ’cause it dissolves easier then, so I guess the liquid is for in those cases that stevia wouldn’t dissolve that easily or if you just feel like having something syrup like. I am highly allergic to Strawberries, but struggling with my weight. I need to know if I can switch from artificial sweeteners to Stevia? Is this plant from the strawberry family? I have found two different stecia plants at Local stores each with a different biological name. Which plant is the sweetest? How do I make a liquid stevia extract using 100% pure stevia leaf powder????? How much filtered water do I use? How much stevia leaf powder do I add to the water? What is the next step? 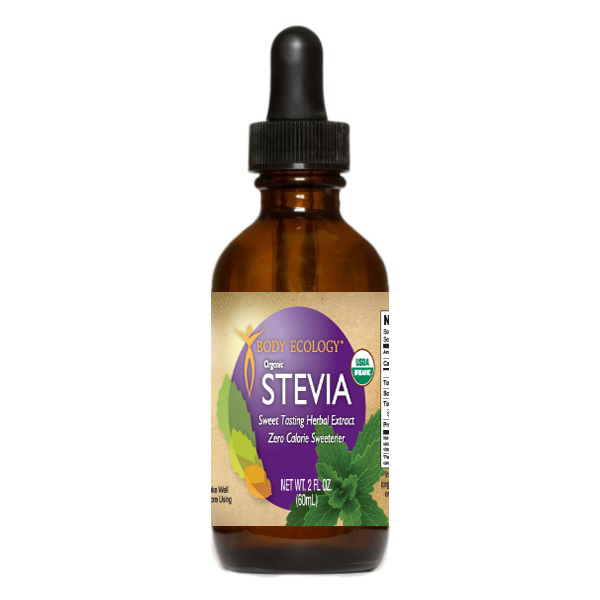 I can’t afford to keep buying the bottled stevia extract like Body Ecology. I purchased the Stevia Leaf Powder and need to know how to use it to make a liquid so that I can use drops to sweeten my herbal teas. Using the powder results in an undissolved grittiness that is quite unpleasant. PLEASE HELP!!!!!!!! Hello…i want to plant stevia but am not sure if our climate conditions are favourable..am in Uganda and we have to dry seasons in Dec to Feb and June to August with temperatures goin as high as 28°c/82°f and as low as 16°c/61°f and 27°c/81F°f and as low as 16°c/61F° respectively ..
and 2 wet seasons march to may and Sept to November with temps as high as 28°c/82°f and as low as 16°c/61°f but the September to November season has less rain…so would the stevia survive and thrive in these conditions..
Is stevia and stevia in the raw the same. I have a recipe that calls for 2/3 cup of stevia. this just sounded like a lot of Stevia.? No, I think Stevia in the raw is cut with dextrose and other things. On the box it says 1 cup of sugar equals 24 packets of stevia in the raw. I would like to know is Skinny girl liquid stevia with white clover honey is any good or just another cover up for processed crap? People keep saying that the stevia they find in “the stores” all has dextrose. I question at what stores they are finding it. I personally don’t know of any grocery stores here in the states that sell it. Yes, they sell a dextrose/stevia blend. That isn’t stevia! That is a blend! And, yes, some so called health food stores will also sell blends along side the real thing. After all, folks should be able to make informed choices. But many sell what is advertised as (and the label says is) 100% pure stevia. I sincerely doubt that will all the legal attention given to stevia over the years the artificial sweetener folks will let anyone get away with a lie of that proportion. I could only find Stevia in the Raw! In Harris Teeter supermarket. How safe is Stevia for Candidiase sufferers? My nutritionists said it is the only ‘sweetener’ she would recommend using for a Candida sufferer. She added that any form of sugar feeds the illness and artificial sweeteners are poisons. I grow my own stevia. I simply steep the leaves in boiling hot water for a few minutes. I then strain the liquid and put the “syrup” in the ‘frig to use with my tea. I’be found that I can re-steep the leaves a few times with added cold water which also can be saved for “syrup”. In canning, sugar is often used as a preservative. Stevia will not serve this purpose. I would guess it will not do much to keep texture or color in fruits as sugar does. I do a lot of canning and freezing. I do not use stevia for either. I do not like it in coffee! It is great in iced tea. TIP: Always be careful not to buy the liquid Stevia from a manufacturer that uses sugar alcohols in it. . . sugar alcohols are not good for you. I have heard that Stevia should not be used in baked goods, I wonder if that is true AND why it would be true. I would like to use stevia leaves when making iced tea. What is the best way to do this? add the whole leaves to the tea & boiling water or dry the leaves, crush them then add to the brewed tea? Thanks in advance for advice. I have been using Stevia when I make hot tea in a press, I have a bag of ground up leaves. I just put a pinch or two in with the tea leaves, seems to work out really well. We grow stevia and use it to sweeten almost everything. It is very easy to grow ,dry and process. Even a container gardner could keep a few plants. It’s fine used in preserves and guilt-free too. I also make my own quick jam with it (using the Bullet blender). It works fine in freezer jam recipes. I use homemade green stevia powder in my freezer jam. Hi Sandy, have you canned with Stevia? If so, can you give me some tips? What I am finding at the stores has detrose. Are your products free from sugars. What kind of stevia powder do you use in your chocolate chip recipe? All stevia is not equivalent! Please advise. I use the pure dried leaf Stevia in my baking….